24 Hour Desk, Fresh Brewed Coffee, Pet Friendly, Copy and Fax, RV and Boat Parking with Electrical Hookups. Air Conditioning, Fridge, Microwave, Hair Dryer, Free Local Calls. Welcome To Historic Eldon, MO. Whether you are coming here for business or pleasure our single highest priority is to make your stay with us a delightfully memorable experience. After a long day of business or play, you can take in a good movie on HBO, or you can surf the internet using our free high speed internet access in your comfortable, nicely decorated guest room. Once you have experienced our friendly, cheerful atmosphere and many guest amenities, you won't want to stay anywhere else when visiting the area. Come stay with us and experience our own unique brand of Ozark hospitality. 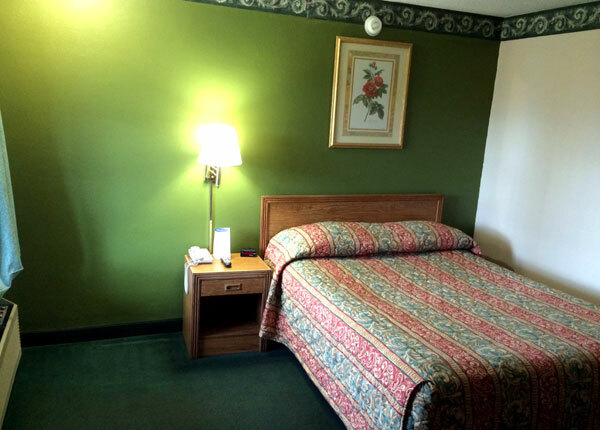 Our spacious guest rooms are equipped with remote color televisions and Free High Speed Internet. Local telephone calls are free and non-smoking rooms are available. Our courteous, professional staff is looking forward to serving you from the moment you arrive at our hotel and throughout your stay, because at the Eldon Inn , affordability, comfort and professional service go hand in hand. Activities : Eldon, MO is located only 15 minutes from the Lake of the Ozarks and 30 miles from Jefferson City, Missouri's state capital. Jefferson City and the lake area offer a wide variety of recreational activities. Attractions : Families can enjoy two waterparks, lots of action-packed arcades, volleyball and a full service snack bar is on site to give you plenty of energy for your day! Dining : Eldon is located in Central Missouri offering fantastic small town dining with a friendly hometown atmosphere, Eldon is conveniently located on U.S. Highway 54 and Highway 52. Golf : As one of the top traveling destinations in Missouri, the Lake of the Ozarks also offers good venues for golfing. A number of golf courses are scattered all around the sprawling greens of Osage Beach, spilling into the panoramic Ozark forests, peaking into the grasslands, and bordered by a healthy density of trees, making it a good venue for golfing excursions or tournaments. Government : Life in the City of Eldon offers “The Best of Both Worlds”.Eldon is a small town with strong family values, great community spirit, and an award winning school district, career center, and churches of nearly every denomination. At the same time, we are located only 15 minutes from the Lake of the Ozarks and 30 miles from Jefferson City, Missouri's state capital. Jefferson City and the lake area offer a wide variety of recreational activities, opportunities for higher education, shopping malls & fine dining. Hospitals : Whether you're a long-time resident or a seasonal visitor, you can count on Lake Regional for quality medical care. From our state-of-the-art hospital to our network of clinics, therapy sites and pharmacies, Lake Regional offers a wide range of services to meet all your health care needs. Shopping : If antiques, collectibles and curiosities are your style, there are dozens of antique stores, stores featuring collectibles and flea markets that may have just the rare item you're looking for. Also outlet malls and just general family stores. University : Lincoln University was founded in 1866 by the men of the 62 nd and 65 th United States Colored Infantries and their white officers, for the special benefit of freed African Americans. Today, Lincoln University's role in the education of Missourians and others and its service to stakeholders throughout the state, the nation, and across the globe is well recognized. Lincoln University continues to serve the needs of its diverse student body through a tradition of offering innovative programs that makes the college experience special. Fishing and Hunting : If you are a fishing enthusiast and want to enjoy fishing year round, then there is no better place on the earth than the Lake of Ozarks. Whether you are a professional angler or just love the outdoors, you can indulge in this pastime here at the Lake of Ozarks. The fishing season at the Lake of the Ozarks starts in early January and goes until late December. Lake of Ozark's is among the most admired hunting and fishing areas of Missouri. Nearly 55000 acres of land is a habitat to varieties of flora and fauna. The climate throughout the year is supportive for hunting and fishing. There is lots of prey for the hunting experts and enthusiasts.